Up your productivity with the KEEN Utility Pittsburgh work boot. 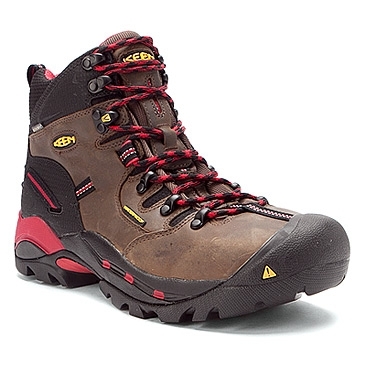 This rugged men's ankle boot has a waterproof nubuck and synthetic upper with a generously padded tongue and collar and secure lace closure for a snug fit; rely on the Dri-Lex® lining to help maintain a fresh interior. Exceptional comfort is offered by the dual-density, compression-molded EVA/polyurethane midsole, EVA heel cushion and removable, anatomically contoured EVA footbed. In addition to contributing ASTM-rated protection, the shape of the left and right steel toes allow for a roomier toe box. A KEEN Key-Tech™ torsion plate pairs forefoot flexibility with enhanced stability. The KEEN Utility Pittsburgh steel-toe boot is finished with a slip- and oil-resistant KEEN.GRIP rubber outsole for reliable traction, wherever the day takes you.